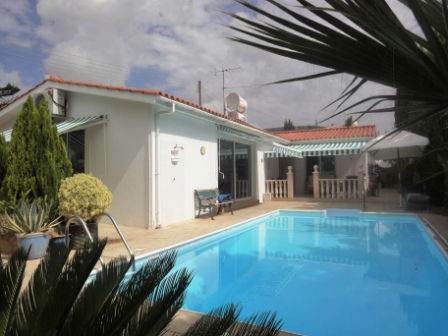 This well presented 3 bedroom bungalow is located in a quiet residential street, not far from the popular village centre of Peyia, and a wide range of amenities. The best beaches of the area are a few minute’s drive away. The accommodation features a spacious L-shaped living room with lounge and dining area. Patio doors all around provide lots of light and easy access to the pool terrace and garden. An attractive archway separates the dining area from the kitchen, which is well equipped with built-in oven, electric hob and extractor fan, dishwasher, washing machine and American style fridge/freezer. Off the dining area is a hallway leading to the bedrooms, and family bathroom. The master bedroom is particularly spacious, with plenty of storage space, and an en-suite shower room. Patio doors lead from here to a raised veranda overlooking the swimming pool terrace. Outside, the current owners have created their own special paradise. The beautifully landscaped garden includes a wide variety of fruit trees and is very private. In addition to the raised terrace with built-in barbecue at the side, there is a lovely pergola area with mountain views. With full title deeds, this property has so much to offer.